Putney High School pupil Bethany Reeves in Year 7, will now record her fanfare with the entire orchestra of the Royal Opera House before hearing it performed at a concert on May 30. A fanfare for trumpets, a cornet and a tuba, Bethany’s was one of 10 winning entries in the nationwide competition, aimed at 11 to 16 year-olds. Bethany has already been to the Royal Opera House to work with top composer Duncan Chapman. Together they are arranging her fanfare for performance by the Royal Opera House orchestra, conducted by Antonio Pappano. As well as being performed at the May concert, each winning fanfare will also be played at the Royal Opera House through the year to remind the audience to return to their seats at the end of the interval. 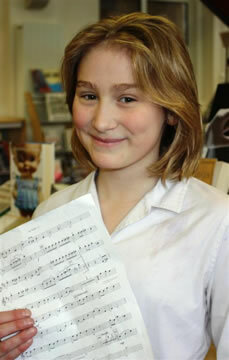 Though only 11, Bethany has already passed Grade 7 examinations on the cello, piano, recorder and clarinet. She also plays the saxophone. Meanwhile, Putney High School’s Natalie Tsang has been awarded a Leverhulme Trust Scholarship by the National Children’s Orchestra for her violin-playing. 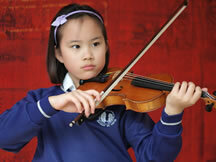 These scholarships are given to four children in each of NCO’s five orchestras for best performances at audition. Over 900 children auditioned this year. Natalie was the only member of the NCO’s Training Orchestra (7-10 years old) to perform at the awards ceremony at the Royal College of Music. Natalie, who is in Year 4, has also auditioned successfully to play in a piano orchestra with the renowned pianist, Lang Lang, at the Royal Festival Hall in May.